FACEBOOK co-founder Mark Zuckerberg dreams of the day we will all share 360 degree virtual reality videos in such high definition that friends will think they are there. But his nightmare reality at the world's biggest mobile convention in Barcelona was that they could not even get the microphones working for his keynote address. As soon as the social media entrepreneur appeared on stage in front of the packed auditorium there were feedback problems in his lapel microphone. He asked for a handheld microphone but the problems continued through the night with the video on the giant screen showing Zuckerberg's mouth movements out of step with the audio. And he and his interviewer's voices went from too hard to hear to almost loud blasts. Zuckerberg, who was sweating profusely, was clearly annoyed that his thought process was being rattled. "It's pretty painful up here,'' he said. 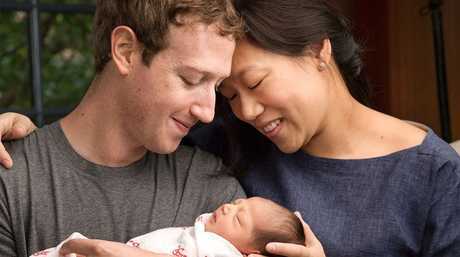 Zuckerberg, who has a three-month-old daughter Max with wife Priscilla, gave the analogy of a child taking its first steps. When he was little, his mother recorded the moment by writing in a journal. Since then, others have shared photos on social media. But he says more and more will use 360 video with devices from makers like Samsung and Oculus Rift to create immersive experiences which are then shared with family and friends. On the Samsung Gear VR platform, there had already been one million hours of 360 videos created. He said video had become the dominant way people shared on Facebook with more than a million hours of content watched each day. 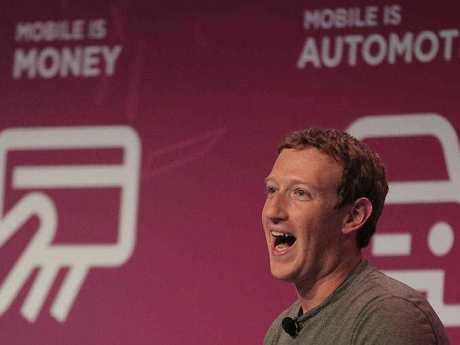 Zuckerberg admitted that would increase demand on telco services which would need to provide better and faster 4G and 5G networks to cope. "It's just this massive tailwind." On a private level, Zuckerberg told of how he continues to work on coding an artificial intelligence system, dubbed Jarvis, to control everything in his home. "You can think of it kind of like Jarvis in Iron Man. "I'm going to start by exploring what technology is already out there. Then I'll start teaching it to understand my voice to control everything in our home -- music, lights, temperature and so on. "I'll teach it to let friends in by looking at their faces when they ring the doorbell. I'll teach it to let me know if anything is going on in Max's room that I need to check on when I'm not with her. "On the work side, it'll help me visualize data in VR to help me build better services and lead my organisations more effectively. Zuckerberg said artificial intelligence in self driving cars would save many lives while the technology was being used to detect skin cancer just as good as doctors could. But he admitted that 'no one was close to knowing how human intelligence works". Talking on social media, he acknowledged problems it created, particularly for young people, by 'increasing pressure to do well' and impress others by sharing a better photo or video. He pointed out Facebook's policy of not allowing children under 13 to join. But he said he remained "pretty pro technology''. Zuckerberg argued that technology had meant "things are getting better in the world'' with less violence and better health and education outcomes. "Our children should really live better lives than all of us." Zuckerberg, whose personal wealth is estimated at $47 billion, plans to spend most of that on helping drive charity projects, including research on cures for cancer. "These are things we are going to be working on for decades."